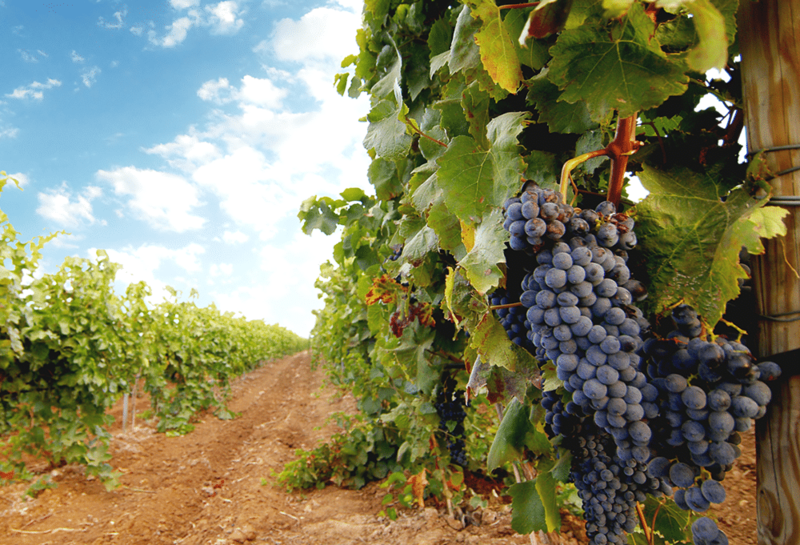 California is the largest and most important wine growing region of both the West Coast and the entire United States. Its viticultural history dates back to the 1800s, but its renaissance and true ascension to winemaking prominence occurred during the 1970s. The first California vines were planted by European settlers and Catholic missionaries, who brought the mission grape to the region. These grapes were used for making sacramental, table, and fortified wines. California produces 90% of American-made wine and supplies more than 60% of all wine consumed in the United States. One of California’s most famous and important wine producing region is the North Coast, which covers more than three million acres to the north of San Francisco and contains the storied Napa and Sonoma Valleys. The main vintages produced in the North Coast are cabernet sauvignon and chardonnay. Another bountiful growing region is the Central Valley, which produces more than half of California’s grapes, the majority of which go into the bulk wine market. The Central Valley specializes in and is highly respected for its production of chenin blanc and chardonnay. Our team at wine.net loves California wines and have compiled a list of the Top 10 Vineyards in California to use as a reference during your next visit to the Sunshine State. Enjoy your trip, and cheers! Welcome to Melville Vineyards and Winery! Join us in our Mediterranean-style estate winery where we exclusively produce wines with wine grapes harvested from our own vineyards. Melville Winery and Vineyards is located within the Santa Rita Hills appellation in Lompoc, California, in Western Santa Ynez Valley. Melville’s Estate features a beautiful picnic area where we welcome guests to relax and enjoy their lunch and wine among the vines. Groups of eight or more guests are welcome with a reservation. Or, join us for an exclusive Vineyard to Bottle Tour and Tasting. The tasting room is open from 11 AM to 4 PM Sunday through Thursday and 11 AM to 5 PM on Friday and Saturday. To learn more, visit www.melvillewinery.com or @melvillewinery on Twitter. Alma Rosa Winery & Vineyards was founded in 2005 by Santa Rita Hills pioneer winegrowers Thekla and Richard Sanford. The Spanish name was chosen as a tribute to the place and the people behind the wines, alma meaning soul and rosa referring to the original California Rancho Santa Rosa land grant, the location of our Rancho El Jabalí Vineyard. Ultimately, our wines represent the soul and are a reflection of the place. Please visit our new tasting room in Buellton. Alma Rosa is open from 11 AM to 4:30 PM on Sunday, Monday, Wednesday, and Thursday, 11 AM to 7 PM on weekends, and by appointment only on Tuesday. To learn more, visit www.almarosawinery.com or @AlmaRosaWines. Just three miles north of Hotel Healdsburg and H2, you’ll find the gateway to one of Sonoma County’s best kept secrets: Alexander Valley. Spanning over 20 miles from Healdsburg to the northern border with Mendocino County, Alexander Valley promises meandering country roads, acres of vineyards, adorable small towns and more than 40 wineries, each producing distinctive, unassuming wines made by distinctive, unassuming people. Highlighted in the SFMOMA Exhibition “How Wine Became Modern” the harmonious blend of agriculture, architecture and artisan winemaking sets Stryker Sonoma apart from other destination wineries in the valley. The winery, designed to pay homage to America’s mid-century architects follows the contours of the gentle knoll it sits upon, allowing the estate vineyard to take center stage as guests turn up the meandering driveway. The state of the art facility takes advantage of this elevated location by offering stunning vistas of the Mayacama Mountains to the east, panoramic sunsets to the west, and vineyards as far as the eye can see. Stryker Sonoma makes is easy for visitors to slow down and enjoy the casual pace of life in Alexander Valley. Experiences range from 90 minute estate tours and tastings to relaxed seated tastings featuring limited release estate wines and perfectly paired nibbles crafted by the chef’s at Jimtown store. Reservations are highly recommended for any of their guest experiences, but if you just want to relax at a picnic table with a glass of Cabernet Sauvignon, the staff is happy to pull the cork and decant a bottle. The Tasting Room is open to the public daily from 10:30 AM to 5:00 PM. Learn more by visiting www.strykersonoma.com or @StrykerSonoma. Since 1985, Ferrari-Carano has been a leading producer of world-class, nationally-acclaimed wines. Vintage after vintage, the wines exhibit a remarkable consistency of style and elegance. Don and Rhonda Carano’s uncompromising commitment to quality and excellence is a reflection of their desire to produce memorable wines that enhance the pleasures of gracious entertaining. The upstairs wine bar at Ferrari-Carano is open daily from 10-5. Learn more at www.ferrari-carano.com or @ferraricarano. As nursery owners in Bucks County, Pennsylvania, Walt and Joan Flowers had long dreamed of combining their love of wine with their passion for agriculture. They knew they wanted to produce their favorite varietals, Chardonnay and Pinot Noir; what they didn’t know was that their path would eventually lead them across country to Northern California’s rugged Sonoma Coast. After responding to a small classified ad in a national wine publication, that’s exactly where they landed. In 1989, after many information-gathering trips to Napa and Sonoma, Walt and Joan purchased 321 acres, including a ridge top, high above the Pacific Ocean on the northern Sonoma Coast. With the same determination they drew on to build their successful nursery business; the Flowers proceeded with the dream of producing their favorite cool-climate varietals in a place they believed uniquely suited to growing them. Today, Flowers Winery produces Chardonnay and Pinot Noir from its two estate properties, Camp Meeting Ridge Vineyard and Sea View Ridge Vineyard, as well as select vineyards in the coolest regions of the Sonoma Coast AVA, which are farmed to Flowers’ specifications by their own crews. In addition to direct consumer sales, the wines are sold to fine restaurants and retailers in the US and overseas. To learn more, visit www.flowerswinery.com or @FlowersWinery. HALL produces critically acclaimed artisan Napa Valley Cabernet Sauvignon, which is available to taste and buy at two tasting room and winery locations in Napa Valley. Owned by Craig and Kathryn Walt Hall, its vineyard collection features five Certified Organic estates producing classic Bordeaux varietals. At each vintage, Director of Winemaking Steve Leveque crafts 16 distinct Cabernet Sauvignon wines which demonstrate the unique characteristics and diversity of Napa Valley. HALL’s highly rated wines include the 2008 “Kathryn Hall” Cabernet Sauvignon that earned #2 of the “Top 100” Wines in Wine Spectator and its 2010 ‘Exzellenz’ was awarded 100 points by Robert Parker, Wine Advocate. Since the first vintage in 2002, over 85 HALL wines have been rated 94 points and above. HALL employs high-density plantings and small vine viticulture combined with two cutting-edge, gravity-flow wineries to produce the highest quality wines. In addition, the HALL St. Helena winery was the first LEED Gold Certified Winery in the State of California in 2009 and earned another LEED Gold certification for its high tech production facility and modern tasting room in 2014, making HALL pioneers in the use of green buildings for the wine industry. Each of HALL’s state-of-the-art winemaking facilities and tasting rooms combine modern art and architecture matched with spectacular settings. The tasting room is open daily from 10 AM to 5:30 PM. For more information, please visit www.hallwines.com or @hallwines. Perched 300 feet above the town of Calistoga, Sterling Vineyards offers panoramic views of Napa Valley. An aerial tram carries visitors up the hill to the winery, whose architecture was modeled after that of the Greek island of Mykonos, where Sterling founder Peter Newton once lived. The brilliant white stucco stands out dramatically against the rugged Mayacamas and Vaca mountain ranges that flank each side of Napa Valley. Mount Saint Helena makes a lovely distant backdrop. The winery’s towers house eight bells from London’s Church of St. Dunstan’s-in-the-East, originally founded in the 10th century. The church was destroyed by fire in 1666, rebuilt, then destroyed again during the bombing of WWII. Each time, new bells were recast from the old metal to give them superior tonal quality. The rich tolling of these ancient bells sounds down through the valley on the quarter hour. Walkways, balconies, and motion-sensitive DVD screens allow guests to take a self-guided tour of Sterling Vineyards’ winemaking facilities. Beautiful outdoor terraces and elegant tasting rooms provide the perfect environment to enjoy exceptional wines while taking in the view. The extraordinary Mediterranean-style architecture, unique aerial tramway, stunning location, historic bells, and attention to visitors make Sterling Vineyards a top destination in Napa Valley. Sterling Vineyards is open from 10:30 AM to 5 PM on weekdays and 10 AM to 5 PM on weekends. Learn more at www.sterlingvineyards.com and @sterlingwines. Domaine Carneros is one of the few wineries where you can relax and enjoy table service in the elegant salon or on the terrace overlooking exquisite views of the endless vineyard-covered hills of romantic Napa Valley. Wines may be tasted in flights or by the glass. Caviar and artisan cheese plates matched to our wines are also available. Tastings are available daily from 10 AM and 5:30 PM, and prices start at $30. To learn more, visit www.domainecarneros.com or @domainecarneros. Yorkville Cellars is located in Mendocino County, 100 miles north of the San Francisco Golden Gate Bridge. The tasting room is on Highway 128, a picturesque road that winds past vineyards, sheep ranches and apple and pear orchards before plunging through the Redwood Forest to emerge at the Mendocino coastline. The vineyards are 1,000 feet or more above sea level, where sun-filled days and cool nights, tempered by coastal fogs, combine to consistently produce premium quality grapes.Yorkville Cellars has two main vineyards on our ranch in Yorkville, California. Both are certified organic. The vineyard behind the tasting room is called Randle Hill Vineyard and is planted to Sauvignon Blanc and Semillon. A total of 14 acres, it mainly dates back to 1982 and was expanded in 1989. The tasting room at Yorkville Cellars is open daily from 11 AM to 6 PM. Learn more at www.yorkvillecellars.com or @YorkvilleWinery. Malibu Wines Tasting Room is a unique location nestled in the Santa Monica Mountains. We are completely outdoors and offer two labels of wine, Semler and Saddlerock. We offer wine tasting flights, bottles of wine, and mimosas by the glass. Our location is unique as it offers large amounts of space to enjoy bottles of wine while listening to live music. We also allow outside food, for those who would like to get creative with what they would like to pair with their wines. No reservations are needed on the weekdays (Monday through Thursday), unless you have a large group or corporate outing. The tasting room at Malibu Wines is open 11 AM to 7 PM Monday through Thursday, 10 AM to 9 PM Friday and Saturday, and 10 AM to 7 PM on Sunday. Learn more at www.malibuwines.com or @MalibuWine. I think I would love to tour these different wineries in California. Maybe I can make it a group trip because a good chunk of the friends consider themselves wine experts. I’m sure they would love the trip.